For many women beautiful hair is still synonymous with long hair. While we covet long hair, we must learn the factors that contribute to healthy hair growth, because at NaturallyCurly we believe healthy hair is beautiful hair. I know many people are looking for shortcuts when it comes to hair growth, but honestly there are none. There are scores of articles on how to grow long hair but our reader Mcnab posted a question on Curly Q&A that echoes a lot of what we continue to hear from the community. What is the fastest way to healthily grow hair long? There is no fast way to grow long hair. While there are plenty of products that make claims about increasing growth, this list is what you should really focus on for healthy hair growth. Eating a balanced diet with the right mix of proteins, iron, and other nutrients can aid in hair health as well as the look and feel of one’s hair. Eating balanced meals provides your body and your scalp with all the nutrients it needs to produce strong, healthy hair. The real dealbreaker when it comes to long hair is length retention. Exercise is a big component of a healthy body (following a healthy diet), as it flushes out toxins through sweat, giving us fresher and more radiant skin. That same sweat gets removed from our scalp and that helps to unclog hair follicles and increases blood flow to our skin and scalp. Increased blood flow brings more nutrients and oxygen to our roots and nourishes them. This promotes healthy hair growth. Stress can cause many conditions that lead to hair loss and I know this firsthand. Whenever I am going through a stressful time in my life, I know that within 2-3 months after the incident, I will have massive amounts of hair shedding. The stressful time causes a change in my body’s physiological functions and causes a large amount of hair to go into the resting phase. As a result, within months massive amounts of hair sheds. I bet many of you are having an aha moment right now as you think back to some unusually stressful time in your life when you experienced a large hair shedding a few months later. Try limiting your stress as much as you can, whether that means meditating, taking out time for yourself, exercising, or just slowing down. If stress can affect your hair in this manner you can only imagine what it does to the rest of your body. Clean hair is healthy hair. Dirty hair clogs the follicles with dirt, sweat, and product and can cause scalp irritations. The idea that dirty hair grows faster is a myth and needs to be put to rest! Washing hair regularly and using a clarifying shampoo when needed is an important part of any healthy hair regimen. Moisture is important in all hair types, but curly hair needs moisture, because it is prone to dryness and breakage. The sebum has a harder time reaching all the strands and is less likely to break and become dry and brittle. Hair needs hydration to retain more length applying and oil helps to prevent breakage. If moisture is our hair’s life’s blood, then heat is our hair’s enemy. Heat styling can cause irreversible damage. Curly girls should be using direct heat sparingly as it can cause damage and dehydration. Luckily most, if not all, styles that require heat can be achieved through heatless styling methods. Just as heat damages hair, so does the use of permanent hair color and chemicals straighteners. Chemical processes penetrate the hair shaft and lift the cuticle to either straighten the hair or color it, and as a result the hair becomes more porous and requires more attention to keep it healthy. No one is saying to completely ditch your options, but know that chemicals can weaken the cuticle and retaining moisture will become a harder task. Regular trims are necessary to keep ends clean and to stop raggedy split ends from creeping up the hair strands. The time frame is up to the curly girl, but color, heat styling, and frequent styling will require more frequent trims. Clean ends that are free from dryness and knots hold better styles and look 100% better than styles with raggedy ends. To some it is, but the fastest way to long, healthy hair is to have a healthy lifestyle free from illness and stress. Honestly, just work on your health and your hair will thrive. Pictured: @mydiamondsandg0ld. 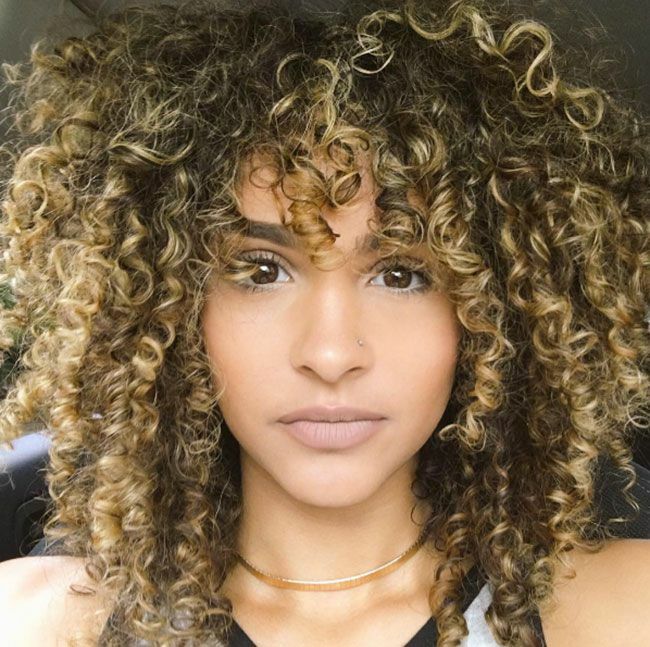 Follow her on Instagram for more curly hair inspiration.